The “Back in Blue” Rail Jam is a chance for skiers and boarders to try their moves on the rails – because facing in the same direction is boring, right? Competitors in two age groups of 14 and under and 15 and over will compete for a piece of the $1,000 prize money, along with lots of merchandise being given away. 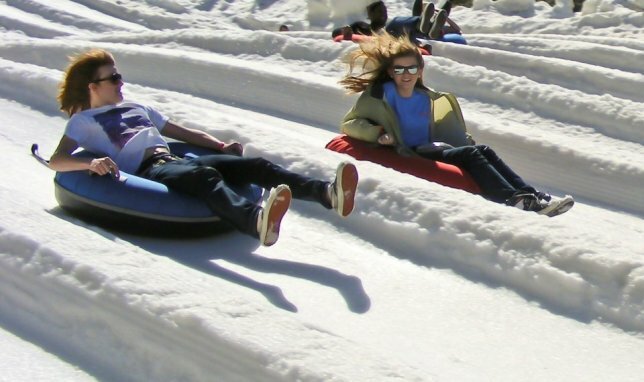 Saturday the family fun starts with Snow Tubing, a blast at any age. If you’re taller than 42 inches and older than 6 you can go solo on your own tube (younger children ride with adults). The Tubing Park is open 7 days per week, with 5-6 sessions each day of an hour and a half each. 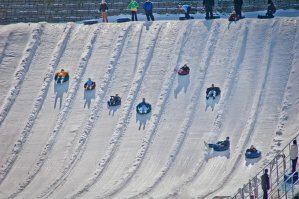 Everyone can tube, young or old – you just get in your tube and sled down the slope, glide to a gentle stop, and Ober brings you back up to do it again. If you’re not laughing and exhilarated by the end of it, check for a pulse! Tickets for Saturday’s opening day can only be bought on the slope, and it’s a first-come basis, so plan early. You can drive up to Ober Gatlinburg, roads and weather permitting or take the tram from downtown Gatlinburg (at Parkway and LeConte) – which can get crowded, but it’s also a treat not to be missed. If you don’t know Ober Gatlinburg be prepared to be impressed. You can eat and shop there, and even go ice skating on the indoor rink. 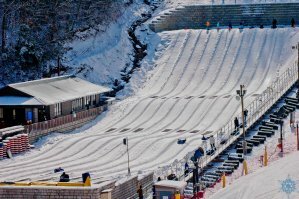 Check it all out at the Ober Gatlinburg web site, and see more info for Snow Tubing times and tickets, and the 2014 Rail Jam.